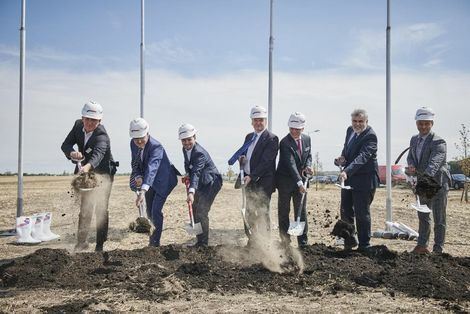 In the presence of Minister-President Dr. Reiner Haseloff and Economics Minister Prof. Dr. Armin Willingmann, Progroup AG performed the ground-breaking ceremony for its new paper factory in Sandersdorf-Brehna. “Saxony-Anhalt is and will remain attractive to investors. We can be proud that the most modern paper factory in the world is being created in our homeland. If a search through Europe for a location leads to a choice for Saxony-Anhalt, then we cannot have done much wrong. We have obviously benefited, once again, from investors already having had good experiences in Saxony-Anhalt. The framework conditions are right in this region. I thank the company for the confidence that it is placing in Saxony-Anhalt and its municipalities”, explained Haseloff. Progroup wants to create around 140 new jobs at the site. The company is already operating a corrugated paper factory in Burg.